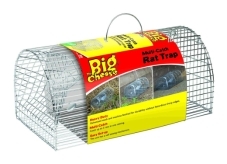 Heavy duty multi catch rat cage for indoor and outdoor areas. For the humane trapping of rats and similar sized pests. Simple self setting mechanism and capable of trapping up to 5 rats in one setting.